The last two months had become a routine for a lot of us. Switch on the television to watch the Indian Premier League (IPL). Even after a decade since it began, the IPL frenzy refuses to die. It reached its finale this Sunday with Chennai Super Kings coming out as worthy winners. M.S. Dhoni, their captain, is one of the most loved characters across India. He has taken the mantle from Sachin Tendulkar, who had a following rarely seen in the sporting world. Apart from being skilled at the game, these two legends have one more thing in common. Rarely, would you see them coming off as arrogant or blowing their own trumpet. Their down to earth nature is what makes fans love them even more. I look for similar traits when I meet managements of companies. In an age, where almost every company is trying to paint a rosy picture, meeting a grounded management is like a breath of fresh air. This Tuesday, I had the privilege of meeting such a management. This is a pharma company that is under our coverage. It's going through some difficult times just like other pharma companies these days. The stock has also corrected recently. I went for an update. I wanted to get an idea of the overall industry as well as the future of this company. The management was as blunt as he could be. There was no beating around the bush. No sugarcoating their recent performance. Your invitation to become a member of Equitymaster Insider expires at midnight tonight. 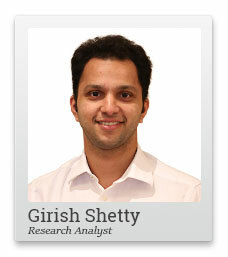 Remember, with this invitation, you get full details on research analyst, Ankit Shah's newest 5 investment ideas. Click here to redeem your invitation. No statements like 'The worst is behind us' or 'Next quarter will be a strong one'. In fact, the General Manager Finance expects net profit to decline this year. He also mentioned that one of their regions will struggle for the next two years at least. I always try to look at how the management reacts during times of distress. Investors sometimes expect excellent performances every quarter. When that does not happen, they're surprised and lose faith in the company. At the end of the day, the stock we are tracking, is a business. No business will have a smooth run during its lifetime. But how the management communicates during tough times says a lot about the values that are instilled in each member of the organisation. That's why I try to assess the steps they take during difficult times. This company is expanding capacity for its domestic and export markets. It is strengthening its foundation and will reap the benefit when the cycle turns. It is also focusing on different geographies to remove the dependency on the one geography where it is struggling. When the management has such a clear long-term picture in mind, I believe, we shouldn't be worried about a short-term bump in the business. They also admitted to us the mistake in their strategy over the past two years and outlined they steps they're taking to rectify it. Am I worried about the prospects of this company? I would've been if I had only a one-year perspective. But thinking about its long-term prospects, I think I may have discovered a gem. I need to do some more due diligence. If it checks out, this could be an upcoming recommendation. Are we heading for a volatile pre-election year? If history is anything to go by, it's time to fasten the seat belt. Every year before the Indian General Election, the stock market has bordered on the extreme. Two of these elections have also coincided with one of the biggest stock market corrections in recent history. Why this volatility though? Why should elections matter to the stock markets? Investors, both domestic and foreign, expect stability at the central government level. A stable government will be in a position to implement a clear roadmap for the future. On the other hand, a divided mandate could mean policy paralysis and roadblocks. Markets speculate on these factors. Also, certain sops are announced before the elections to appease the masses. That too has an indirect effect on listed companies. Should investors be mindful of these factors? Does this one year volatility even matter for long-term investors? It ideally shouldn't but the next year can certainly throw up a lot of opportunities if there is an irrational reaction to high-quality safe stocks. PS: Today's the last day! Research Analyst Ankit Shah, has released his latest special report about 5 stocks that have the potential to generate solid returns. These stocks were recommended under our premium services, but thanks to an unusual new offer, he can share them with you... But this offer is available ONLY until midnight tonight. Find out how you can get the report here. Equitymaster requests your view! Post a comment on "I Looked for Virtues of Dhoni and Tendulkar and Found a Gem of a Stock". Click here!